You are expert in some sphere and have a wish to share your knowledge? Or, maybe, you want to create a personal site to write about your experience? Then it’s time to go online to catch the attention of your target readers! 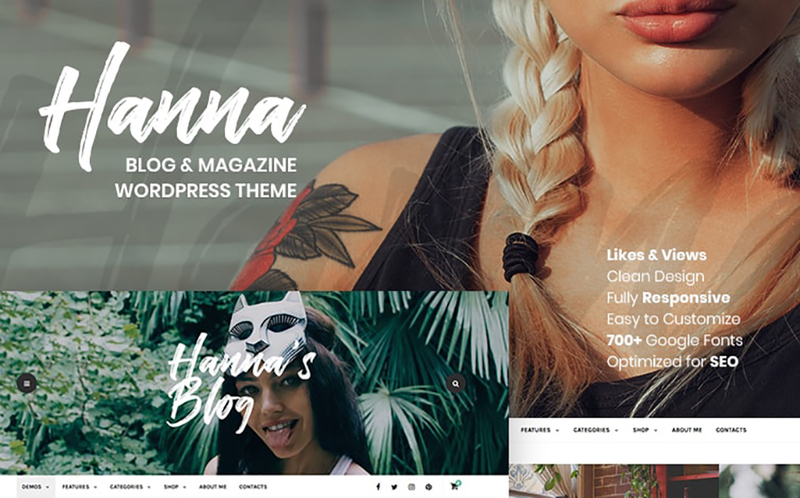 No matter, which sphere inspires you, as it is possible to build a fully-featured site according to your requirements, and you can do it on your own using top-rated personal blog WordPress themes! You may ask: “why do I need a website? I can use blogging platforms as well” and the answer is quite simple. Actually, when creating your own separate blog you get access to free writing and creating your personal brand. When people read a collection of articles, they never notice the author’s name, usually written in small, somewhere below the main text. Quite the opposite, when you post your articles on your own personal blog, you attract much more readers and form your audience, as after reading creative and informative texts they will definitely visit your page again. Not to mention that this makes a great influence on your income and public image. So, if you are ready to start your own independent project and find your audience, let’s learn how to do it with minimum time & money waste. Using pre-designed WordPress themes is a good solution for both professional writers and beginning bloggers. It doesn’t matter, how many articles you have and which field you choose, as the most templates are multi-profile and you will have an opportunity to pick any sphere you want to work on. They are user-friendly and easy to customize, so the only thing you need is to decide which design you need and start using it! Also, the themes are responsive and have mobile-friendly layouts. That means that your readers will have an opportunity to enjoy your posts using their handheld devices – smartphones, tablets etc. Your site will be quickly adjusted to any screen size..
1. 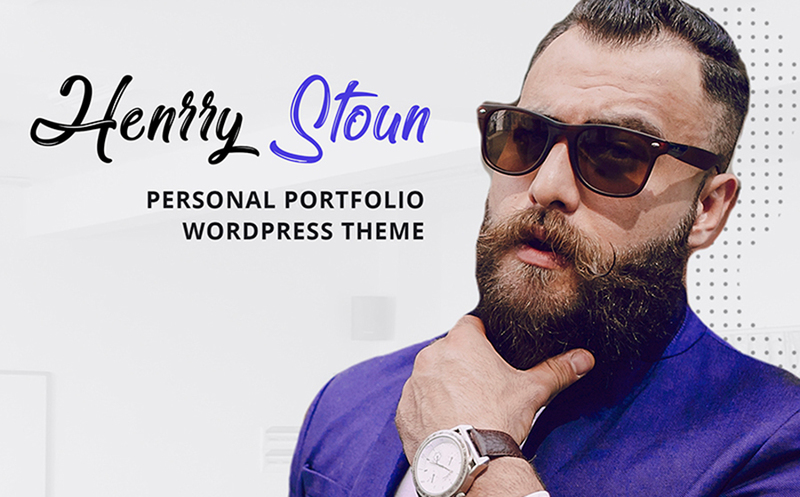 Look through the top-18 portfolio & blog WordPress themes collection and watch the live demos of the designs you like. 2. Pick one theme you like the most and learn about its features. When the decision is made, look at the pricing at the official provider’s site and mark the additional stuff you need. After that, purchase it and run the installation process. 3. Use the documentation to customize your site properly and save time on searching this or that button. Take into account, that some templates are ready for 1-click demo import, so you will have an opportunity to add all features from the live demo and get a ready-for-use website. Also, you could change some colors, upload photos and set up your website’s visual design. 4. Post a salutatory article and be ready to welcome your first follower! 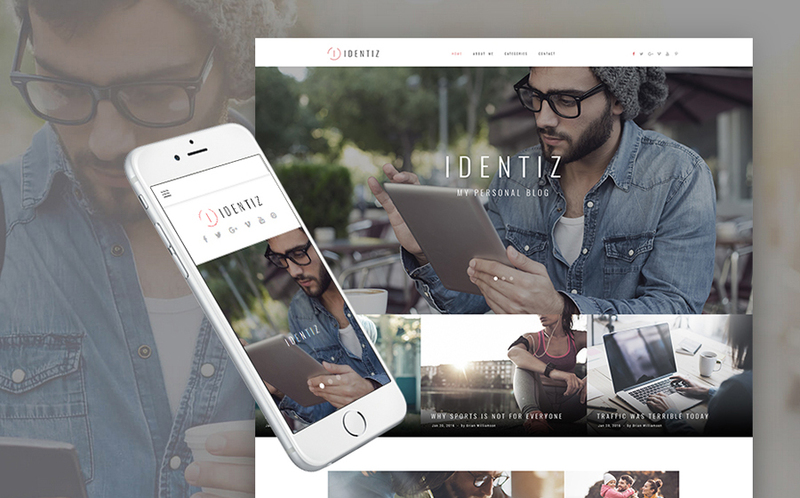 This template is not only mobile friendly but also bootstrap, easy-to-install, and WPML-ready. It has a built-in visual editor, which will help you to create an awesome blog hand over fist – just move some elements and see how it looks like right off the bat! The theme is fully responsive, so you will easily build a mobile, tablet and desktop friendly site just using it. This design has a convenient 1-minute installation and configuration, coupled with 1-click demo data import, so you will quickly import everything you like from the preview pages. Also, this template will definitely please your clients with multiple social options and sharing integration. The template features a user-friendly admin panel that will help you to build a fully-fledged website from scratch. It is 100% mobile-friendly and search engine ready, so moving your blog into search ranking top will take just a little time. Besides, this design goes together with a long-term professional support by the competent web-developers team. This theme goes together with a convenient administrator panel, round-the-clock support, and plenty of other useful features. It can be used both as blog and gallery, so you will have an opportunity to combine these two site types. Also, it stands out with its easy installation and customization, as it has a visual editor and elementor page builder included. 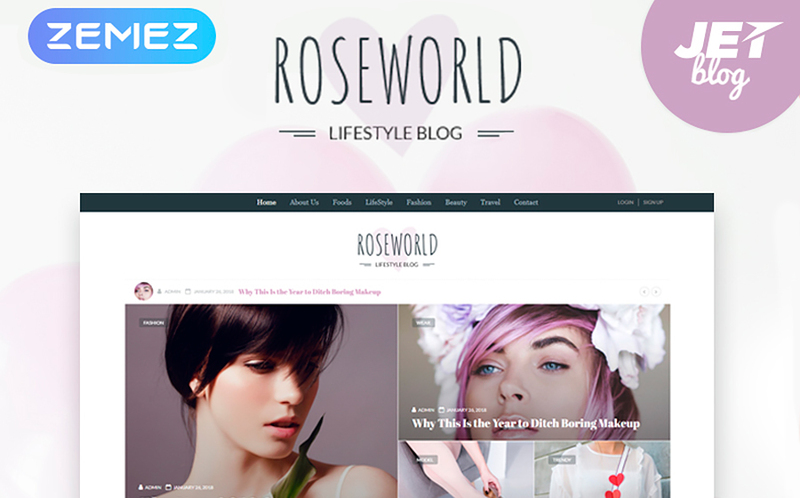 This theme includes 4 blog listing layouts variations with unlimited color options: masonry, grid, list, and standard. So, you will have an opportunity to choose the one you like and adjust it to your blog idea. Also, with this design, your site will attract clients with easy-to-read Google fonts and custom widgets. 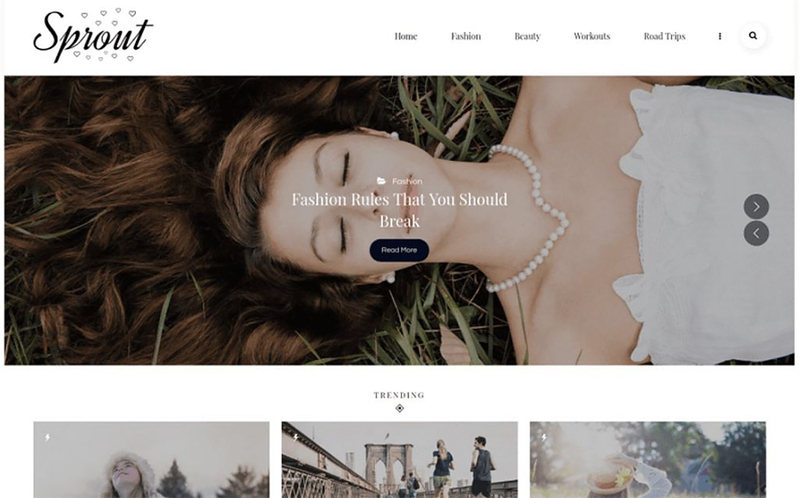 Using this theme, you will have an opportunity to build a fully-featured style blog with WooCommerce compatibility. Moreover, you will be able to make your site #1 in search results list with the help of the WordPress SEO compatible with Yoast plugin. What is more, the child theme is in the package! With this theme, you will never forget about your meetings and publications, as it has a useful calendar included. It includes all the features you need for a blogging site, so you will definitely find all the necessary elements in the package with the detailed documentation for novice developers. 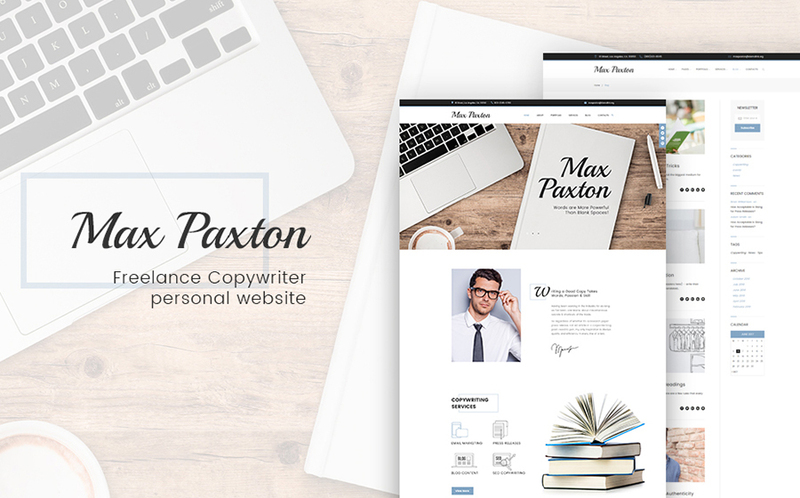 This is a simple and universal solution for creative writers or website authors because this theme has both a blog and portfolio features and can serve as an example of your writing skills. In addition, it has user-friendly contact forms, portfolio masonry, price tables, and even clients carousel! 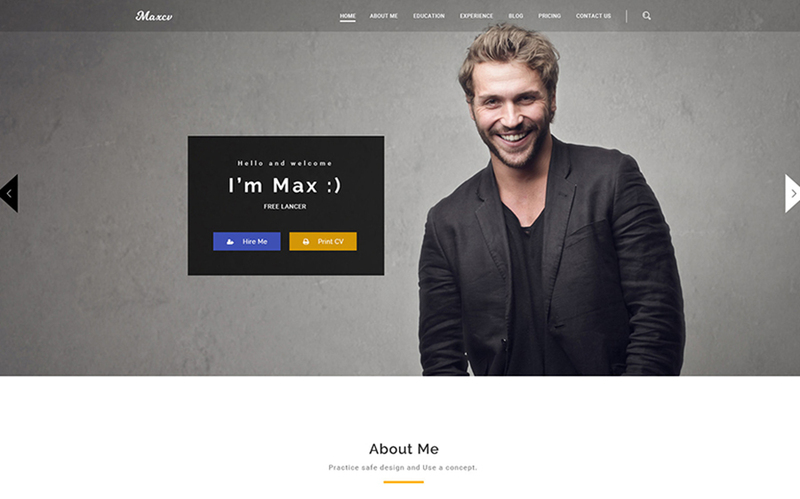 This template will be suitable for a blog, personal website, writer’s portfolio or project presentation. It has a minimal design, so your site will never be overloaded with extensive details, just fill it with your content and it’s done. Also, you will have an opportunity to build your site even without any programming skills, as the detailed documentation goes together with the design. 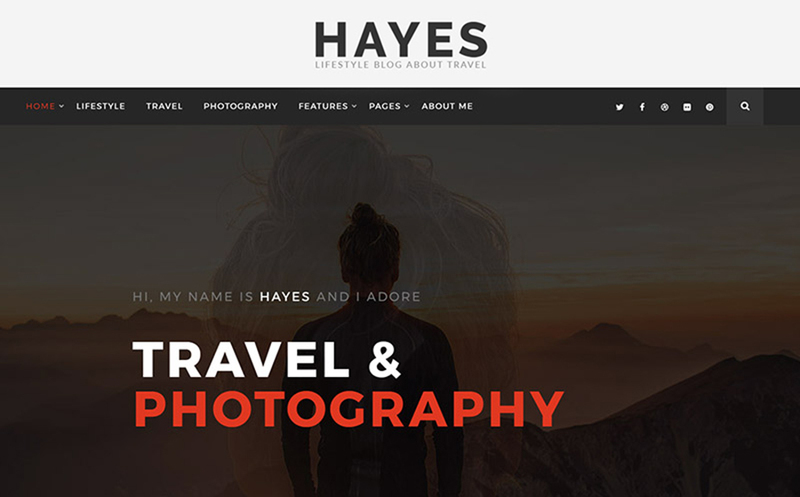 Using this design, you will be able to start your own blog or photo gallery and inspire new followers! 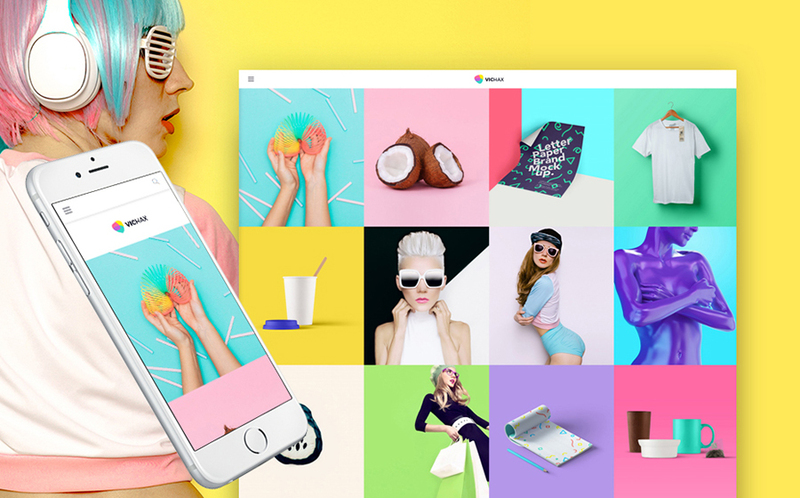 The theme has everything you need to take your site off the ground: social media options, jaw-dropping galleries, sliders, and management tools, sharing buttons integration, and even more. Watch the live demo below to see all features and try them on your own. As you can see, this theme has a minimal design with a clear structure. If you think that it is too sober, we have good news for you – this WordPress template has unlimited color options, and you can choose the most suitable combinations for your project! Beyond that, you will have an opportunity to complement the template with your custom logo and favicon. 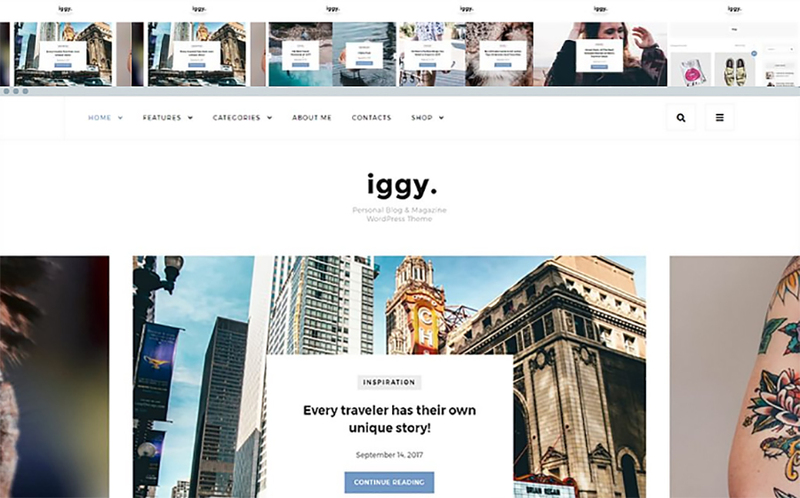 Using this theme, you will quickly and easily set up your site, share your experience in the blog section and show the most valuable posts in a special titled gallery on a homepage. 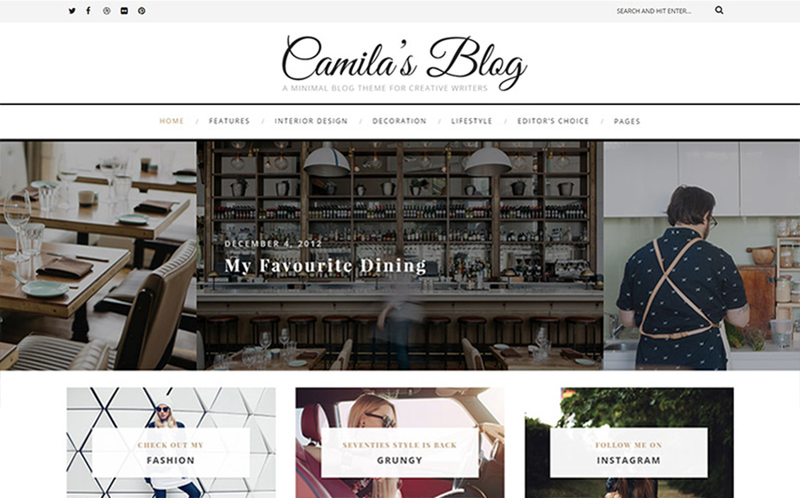 It has an Instagram footer and lots of widgets that will make your blog look attractive and easy-to-use. Also, the theme has an infinite scroll which is necessary to catch clients’ attention and ease the navigation. This is an excellent design to share your experience and special receipts, as it looks stylish and catchy. 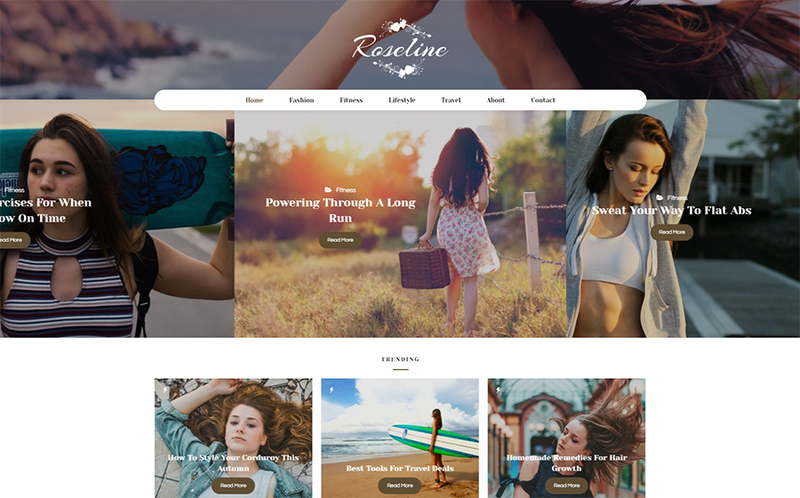 The theme features easy-in-use admin panel, fully responsive design, search engine optimization tools, theme color switcher, trending posts and revolution slider. 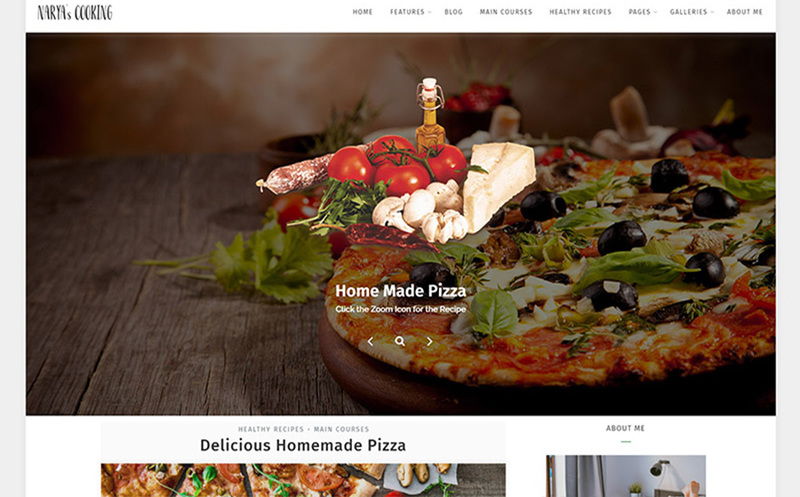 The theme stands out for its modern minimal design, easy installation, and user-friendly management tools. 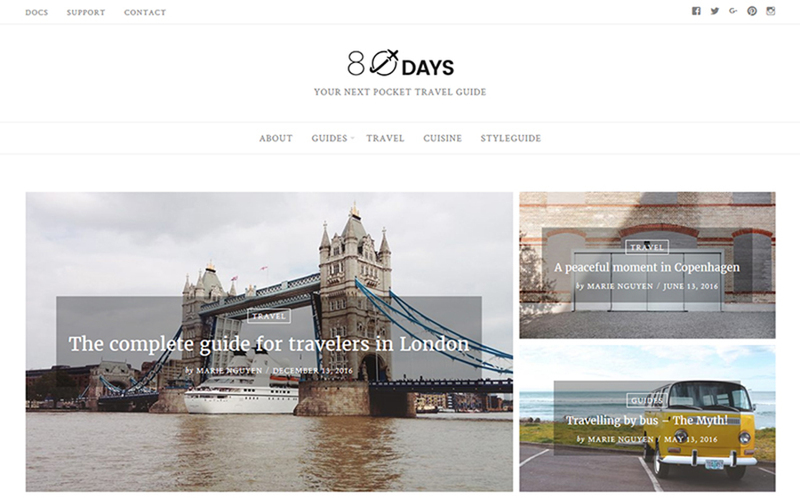 It includes 5 variations featured slider, 5 different blog layouts, 2 header variations, sticky navigation, and sidebar. As can be seen, the design is pretty stylish and up-to-date, so it will definitely attract the modern Internet-audience. It has a user-centric administrator panel that will help you to run a website without any coding skills. In case of any issues, you can contact the provider’s support team and the talented programmers will help you immediately! 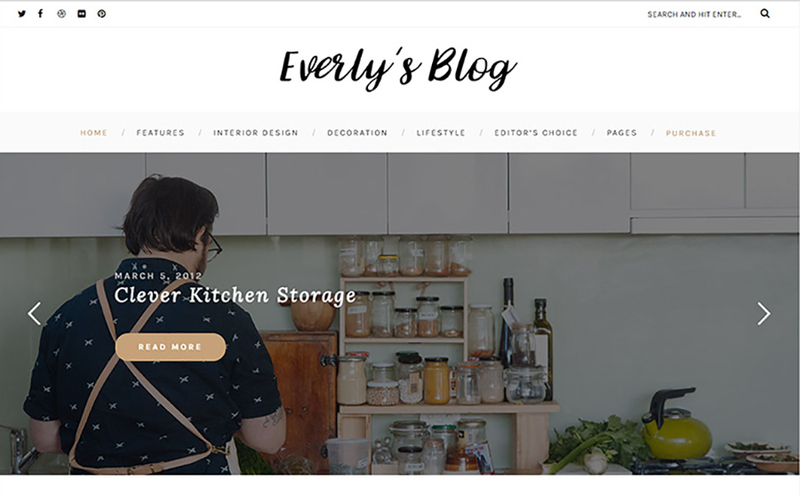 This is an excellent example of the modern design blog or portfolio page, as it catches attention and attracts people to read your blog materials. It is fully responsive and cross-browser compatible, so your website will look and run perfectly on any devices with any browsers. In addition, it has a convenient commenting system which will allow you to ease the communication with your followers and readers. 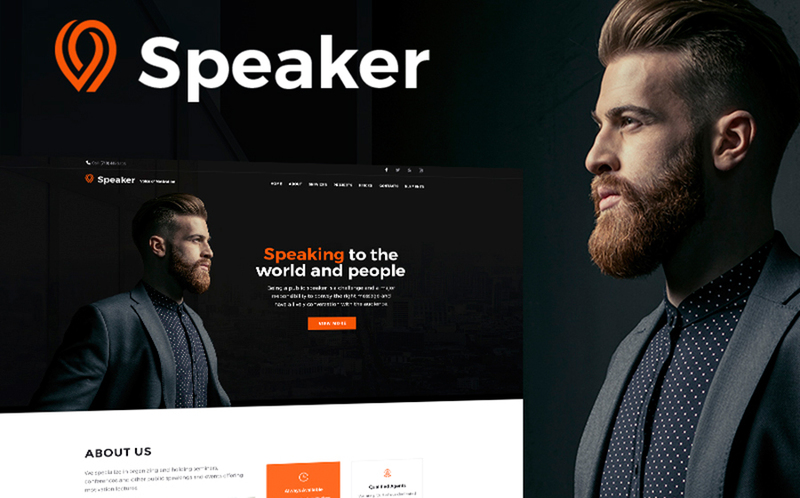 With this theme, you will have an opportunity to build an inspiring portfolio with a blog or corporate site. It is not only responsive but also SEO-friendly, retina ready and Ecwid compatible, so you will easily add an online store to your future site. Besides, this template is easy-to-install, so you will deal with it without any great effort. 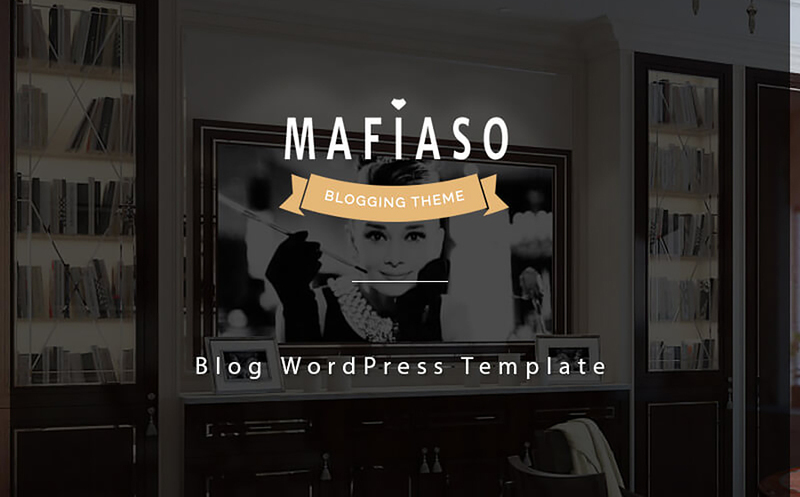 This is a well-documented blogging template you can customize hand over fist. It is complemented with a top-rate admin panel, multiple setup options, visual editor, and powerful performance optimization. Besides, the design has various social options, so your clients will have an opportunity to share your posts and invite friends to the website. 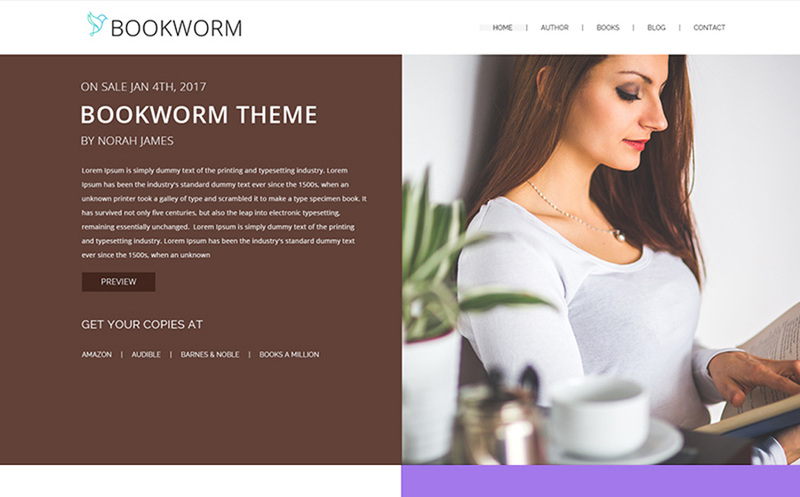 As you can see, all WordPress themes from this catalog are user-friendly and attractively designed, so they will suit any your project. In fact, this is a perfect way to go online, no matter how experienced you are. Even if you just want to start your blog and have no writing experience, pre-made templates will allow you to forget about design aspects and concentrate on the main point -developing your blog content. Just look through the documentation included and start setting up your design using simple admin panel! Don’t put it into cold storage, start your online-career right now!